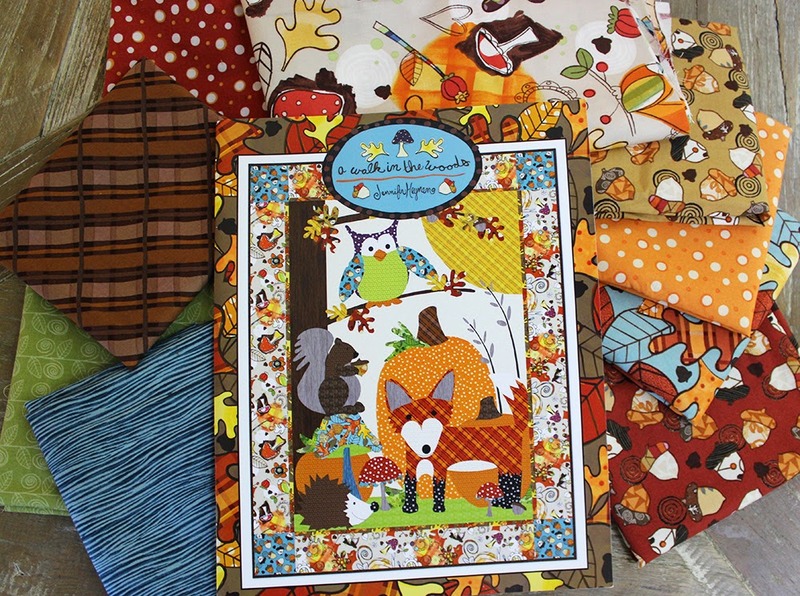 My new fabric collection named A Walk in the Woods is in stores now. I created a pattern booklet to go along with the collection. It has a wall quilt, shown there on the cover, a table runner, four placemats, stuffed pumpkins and vines, napkins, and napkin rings in the book. If you follow me on Facebook or on Instgram you might have seen me starting to sew those projects up. I'm still working on them and will be posting more images soon. In the meantime, I wanted to have a giveaway. have five half yard cuts and four fat quarters of my collection here as well as my pattern booklet. I'm going to send these all to one lucky winner. Want to buy some of these fabrics? As always, ask your local quilt shop first, it's always fun to pick them out in person. If you can't find them there then google "Jennifer Heynen, A Walk in the Woods, In The Beginning Fabrics" and you find lots of online retailers selling the fabric.